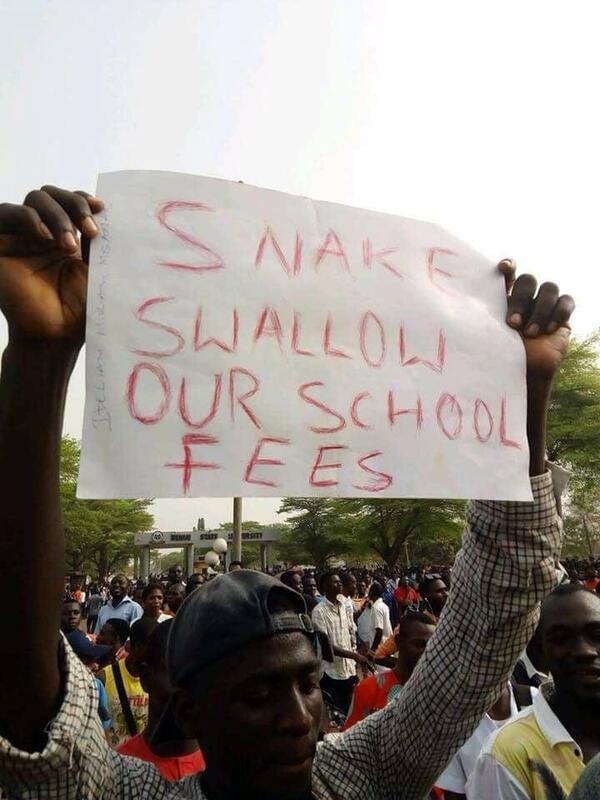 Some students of the Benue State University have explained why they are unable to pay their school fees. Source reports that students of the institution frustrated academic activities over management’s refusal to allow them have access to the examination hall over unpaid school fees. The authority consequently ordered the security to shut down the school till further notice. However, when a reporter approached some of the protesting students for comments, most of them blamed ‘snake’ for their inability to pay their fees. A final year student of Business Administration, who simply gave his name as Sure, claimed a snake swallowed his fee. "I don’t want to spill over because this is my final exam. The management has to be considerate because of what the economy is saying. We will pay when the snake vomit the money,” Sure said as other students behind him chorus ‘yes’. Another EXCO of the students union government, who would not want his name mentioned, said this was the first time students would be stopped from writing exams over unpaid fees. “It has never happened in the history of this institution. Students would be allowed to write exams but would be allowed for clearance during graduation,” he said. On his part, a student of the Theater Arts department also claimed a spiritual snaked sneaked into his house and carted away with his money. "Oga journalist it is mysterious. I was to pay my school fees today but a spiritual snake entered my room and swallowed it. They should juts help me to write this final exam while I search for the snake,” he said amid laughter. At the time of this report, students have blocked the Makurdi-Gboko road.